We stayed 8 days at Cave Springs National Forest campground north of Sedona in Oak Creek Canyon. 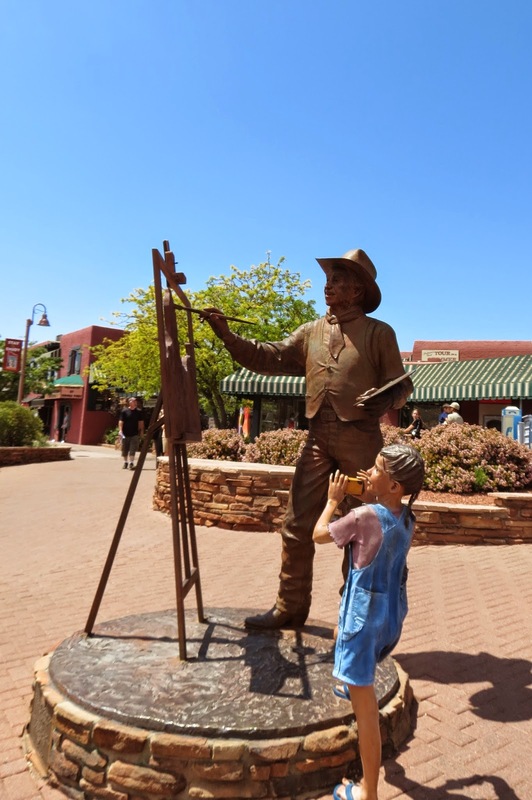 We did a lot of things during that time, so there will be a series of blog posts coming from the Sedona area. National forest campgrounds are great, and an economical way to spend time in a touristy area. The "cave" is at the base of the cliff here, but has been fenced off and bricked over to prevent exploration. We'll blame it on Fred who created this graffiti in 1915. Here are some views as we drove from the campground into Sedona. 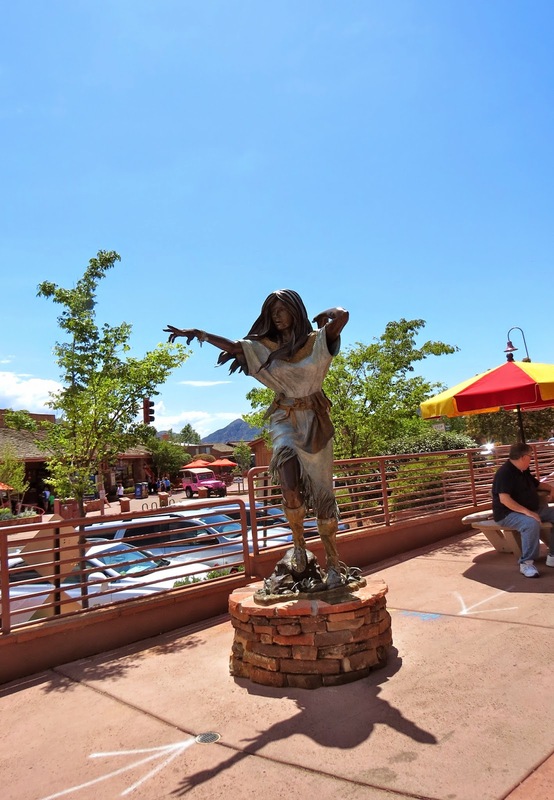 Sedona is an "artsy" city...lots of sculptures. This one is Sacajawea. We came to town to check out and reserve a Pink Jeep tour. That will be a separate blog post. While there we were talked into a "free" helicopter tour too...also a separate blog post. Except for the outstanding red rock scenery all around, Sedona is very touristy, and crowded especially on the weekend. Instead of painted donkeys or horses, they do painted javalinas in Sedona. More red rock views from downtown Sedona. Meanwhile back at Cave Springs, Oak Creek runs through the campground. There are easy trails for birding along the creek and through this apple orchard, left from an old homestead that was here. Cliffs rise on both sides of the campground. I like this tall pine growing between the cliffs. Thistle says it tastes good. Thistle and I took this trail that leads from the campground to the top of one side of the canyon. It's cool, and Thistle is very enthusiastic. Elevation is 5500 feet at the campground and gains another 700 feet going up the trail. Stopping to breathe here. Lots of switchbacks. Don't trust those supports...they are falling down. I was sitting down resting here...Thistle was pulling. At the top it widened out to a meadow. Views of Oak Canyon from the end of the trail. Hoodoos on the other side. I put some birdseed outside my RV and attracted some Spotted Ground Squirrels. There were hummingbirds at my feeder and many other birds I didn't get a picture of. Stay tuned for the great helicopter adventure! All the pics were great. Really nice campground. Any trouble getting Birdie's bigger Class A in there?